From my interactions with people on the autistic spectrum I have come to understand that there are times when no more words can be processed. The brain is too busy sorting out the jumble of messages that it has received. At that point communication may be shut down, and when the person is ready, may be more effective by other means. It struck me yesterday that this may also be true for Bubble, who disassociates frequently. H and I decided to try out a different way of giving her more control over telling us how she is feeling. 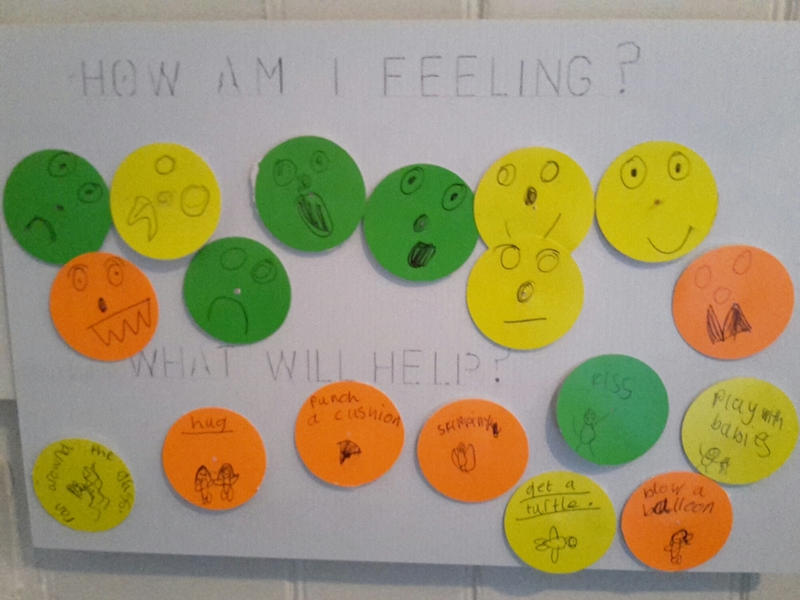 This morning Bubble and Squeak drew some faces: angry, scared, sad, and happy. They then suggested some techniques – tried and tested over the years – which may help. They bluetacked them on a board, and then had a practice, taking turns to pick a face and bring it to one of us. We then suggested they select a possible solution from the board, and go and try it. They then returned to tell us if it had worked. The trial run went ok. Squeak was extremely dramatic. Bubble was a little more tentative. Situation normal. We hope that it will help the girls to feel more in control of naming their emotions, sharing them, and seeking a solution. Time will tell. As the workplace posters say: if you keep doing what you’ve always done, you’ll get what you’ve always got. So we’re trying something different. We’ll see how it goes. It’s that time of year again. It can be a bittersweet experience for many of us. Nationally and locally the rhetoric will be unrelenting. Adoption is a GOOD thing. Do YOU have the love to give a child? Etc. and turgid so forth. Those of us who are affected by adoption all have a different and individual story to tell. I love Bubble and Squeak. Sometimes my heart feels as if it will burst for them. I have cried tears of joy. I look at my partner loving them and I feel deep love for our family. We are lucky. We have a good, no a great, Adoption Social Worker. She gets ‘it’, the Big T. Trauma. She listens. She observes. She supports. She provides access to psychological assessments. We’re about to start therapy funded by the Adoption Support Fund. We struggled for over a year to get access to that support. We were initially told by the team manager we were ‘anxious’, that Bubble was a ‘typical’ child. We were not anxious; we were furious. We went to the Head of the service in order to get the support our family needs. When I went back to work after adoption leave I asked to work flexibly. Managers prevaricated and then rejected my request. I had to go to the Director to get my request approved. I’ve been doing the same hours for 2 years. Now my employers want me to work full time again. I can’t support Bubble and Squeak and work full time. It is that simple. I wasn’t offered any other solution. There was no discussion at all. Just a rejection. I have appealed. They have not reached a decision. I have had to submit a grievance. They have not responded. And then there’s the intimidation. I’ve submitted another grievance. They have not responded. We’re now past the date they told me I have to return to full time hours. The stress at times feels overwhelming. Luckily I’m an adopter and have learned to be hardy and resilient. I am fighting back. I have the union and Google on my side. My employer has access to lawyers and HR on theirs. It feels like a secular version of David and Goliath. And whilst all this rages on I still support my adopted children and work as best I can. My job? I’m a local authority social worker. So my message in National Adoption Week is simple: listen to all those lovely happy ever after stories if you will. But don’t be fooled. For the government and local authorities it’s about statistics. For those of us in the thick of it, it’s more about survival. My current situation has found me reflecting about what really matters. This isn’t a ‘what would you rescue if your house was on fire?’ question. It’s more of an ‘at the end of your life are you going to be content about the way you have conducted it?’ sort of question. We’ve all done it. You, me, the person on the Clapham omnibus. And we have all reached our conclusions. This is my blog. And this is my conclusion. Respect, human connection, love, justice, doing your best, standing up for what you believe is right. These are the things that matter to me. 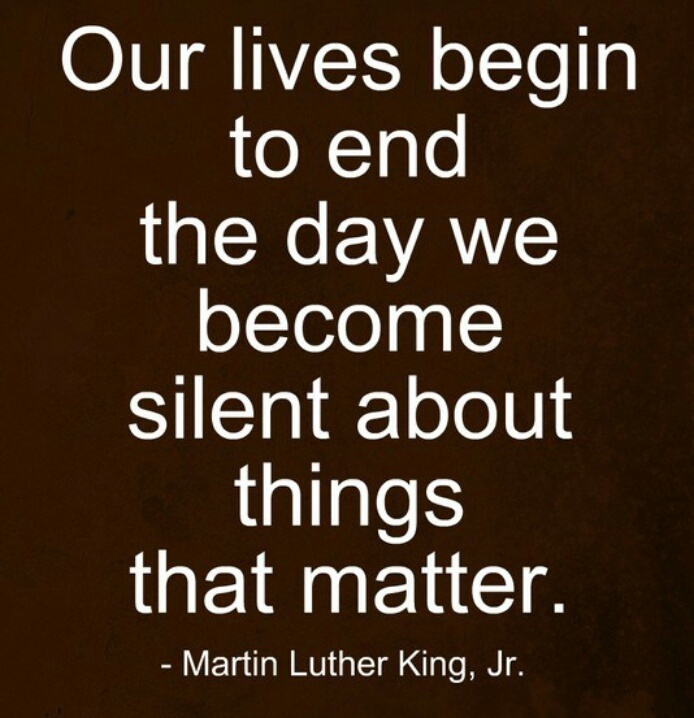 I’ve always attempted to speak out about things that matter. I’ve always thought that it is why I remain a social worker. It is my job to care about and fight for the rights and needs of people I work with. Our adoption journey has offered me a personal illustration of what people have to do to get the services they need. I know how tough it can be. I’m being bullied at work. Of this I have no doubt. So I’m speaking out about it. I’m fighting back. In this process I’ve realised that I’m fighting back because I matter. I matter as much as my children, my partner, and my ‘clients’ and their families. It’s very liberating realising this! So I thank you Little Bullies. Your intention may have been to free yourselves of a challenging member of staff. The effect, however, has been and will continue to be, very different.